QUESTION: I can go to bed at night and my blood sugar is 112 but in the morning its 157 and when I fast it goes up..why?? To give an exact answer to your question, I need to know if you're a diabetic or not, your age and some of your lifestyle habits and foods you use to eat. Anyway, although I don't have all these information, I will try to give an explanation to your morning high blood sugar. If you think you're not a diabetic, you shouldn't exclude the possibility you might have diabetes. Here's what happens: If you go to bed with normal blood sugar levels, during night (exactly early in the morning 4-5 am) there are some substances (hormones) our body produces to wake us up. 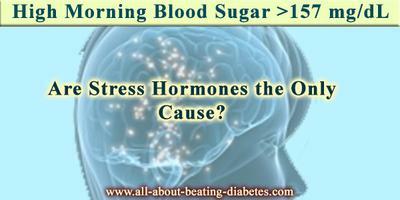 They are called "stress" hormones, which raise blood sugar levels. In a normal person, this rise is accompanied with increase in insulin levels too. As a consequence, a normal person is woken up without having high blood glucose. In a diabetic, this doesn't happen, especially for type 2 diabetics. Their body still produces a little of insulin, but the insulin is not able to transport the glucose inside the body cells. Thus, glucose remains in the bloodstream and diabetics they wake up with high blood sugar levels and high insulin levels (induced by high blood sugar). What you can do, you may check again your fasting blood sugar levels, do an oral glucose tolerance test and check your A1C level in a lab. In this way you'll make sure if you have diabetes or not and what precautions you must take. Hope I answered your question. Take care! COMMENT: I have the same problem, before bed, it is normal but when wake up in the morning, the blood sugar level rasies up to 144. I am not taking any medicine and then I checked the HbA1, the reading is normal, about 5.6%. What else i can do to bring down the reading of the sugar level at the early morning (before breakfast)..
i have tried exercise and not eating rice, the result is no difference. I have to inform you that the A1C test gives information for the blood glucose values during the last 2-3 months. So, if your blood glucose is high for about a month, the A1C will show that the average is normal. With regards to the morning blood glucose of 144 mg/dl, you are right: it is really high as the normal result has to be between 64.8-104.4 mg/dl. However, there are few things, which you can do in purpose to bring your morning blood glucose level back in the normal ranges. The first thing is to avoid the consumption of meals rich in carbs at dinner. In this way, you will reduce the intake of glucose in the evening, which will lead to normal blood glucose level in the morning. Just for your information, I have to tell you that you have to avoid the consumption not only of rice, but even the consumption of boiled potatoes, pork, beef and others. Besides this, it would be better for you to concentration mainly on vegetables and fish. Other thing is to do some light exercises after having a dinner. This activity will help you to reduce the glucose concentration in your blood, which of course will lead to lower result in the morning. According to my opinion, it would be better for you to start using certain herbs, like gymnema sylvestre, bitter melon or cinnamon, because they can help you to keep your blood glucose level within the reference ranges. In addition, it would be better for you to talk with your doctor about eventual drug treatment at bedtime, because in most cases such elevation speaks about diabetes. So, talk with him/her if you need to run some more tests, in purpose to confirm or exclude diabetes as diagnose. First, I want you to understand that I am not a medical doctor nor an expert on type 2 diabetes. I am just a plain type 2 diabetic with no special qualifications. From what I have been learning from my 20+ years experience with my disease using exercise as my only anti-diabetes medication (Heart-healthy, natural, fresh (raw or cooked), unprocessed, and whole foods I have been eating are not a part of my diabetes control method because they are mostly carbohydrates. Carbohydrates are notorious for creating high after-meal and high fasting blood sugar levels. ), normal A1c percentages prevail over high fasting and high after-meal blood sugar readings. Please note that despite my sky-high diagnosis fasting sugar of 468 mg/dl in July 1991, I was given the permission by our family physician then to use exercise as my only medication. But he required me to pass a stress test first. Most of my past A1c's were from 5.2% to 6.3%. I have never had any hypoglycemic episode, have never had any diabetes complications, and have been healthy, strong, and happy since my diagnosis. Am I suggesting that you follow my example? No, not at all. I am just telling you my story. If you think that you can do better than me, please do. It is your body, your health, and your happiness at stake. Your type 2 diabetes will either be your nasty enemy or a friendly ally. It is your choice every day the rest of your life. For details of what I am talking about, please google my name and check out the entries you find.